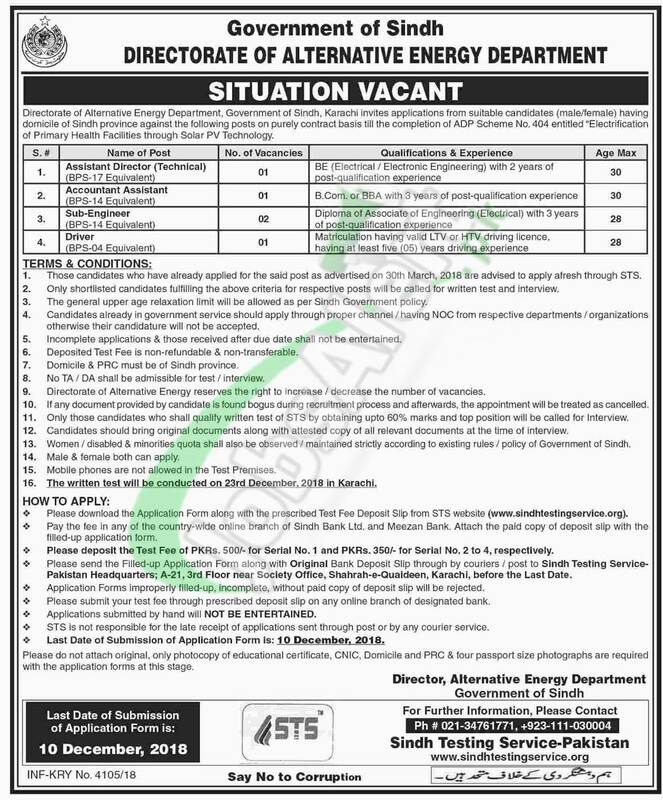 Here you'll get Energy Department Sindh Jobs 2018 STS Application Form Download Online from www.sindhtestingservice.org for the newly announced jobs under Sindh Government. Jobs in Energy Department Sindh are (Assistant Director (Technical), Accountant Assistant, Sub-Engineer, Driver). These positions are on contract basis till the completion of ADP Scheme No. 404 entitled "Electrification of Primary Health Facilities through Solar PV Technology". Candidates willing to apply should hold qualification from Bachelors to Matric with relevant field experience as per the demand of vacancies. So, only suitable candidates should apply on prescribed form of STS on or before the last date 10th December 2018.